I’m a sentimental person. I love nostalgia, and keep myriad pictures and other memory-provoking items in my home. I find the past, even a past I didn’t live in, to be fascinating. This longing to stay connected to the past is one of the reasons I minored in history. I do understand that there is a fine line between being a nostalgic and a hoarder, however. Which is why I have been somewhat ruthless about cleaning out our basement and closets, and more selective in the things I keep to remember my children’s school days. But one way I indulge in my nostalgic bent is in keeping and creating traditions with my family. 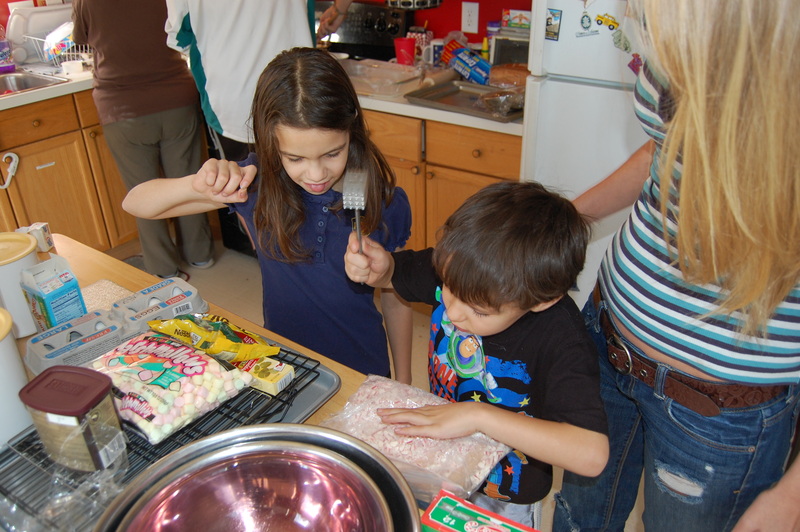 Like most people, many of our traditions center around the holidays. On Christmas Eve, we spend the day baking cookies and finger foods for our annual Christmas Even party. This tradition comes from my favorite childhood memories of spending the evening at my step-grandparents’ home, which was filled with family and friends, laughter and carols. We also have Finnish pancakes on Christmas morning after the presents have been opened. New Year’s Eve is game night for our family (at least until the kids grow old enough to make their own plans). We build a Leprechaun trap the night before St. Patrick’s Day. (That’s a tradition the kids invented and suckered me into!) Easter breakfast is normally hard-boiled eggs and kielbasa, a throwback to my Polish grandma. But we also have other traditions throughout the year. On each child’s third birthday, we take them to the library and get them their own library card. (Just one more child to go!) The tooth fairy brings a shiny gold dollar or big silver half-dollar for teeth lost. The first and last days of school are celebrated with a fun activity and dinner out. In recent years, after acquiring a projector that connects to the laptop, we have begun Backyard Movie Night every weekend during the summer (weather permitting). Last summer, we installed a gazebo and my handy husband made a proper movie screen that hangs on the swingset; now we enjoy BMN in style. 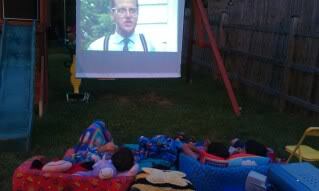 Backyard Movie Night is the most anticipated night of the summer week! When discussing traditions with some friends, one said that her mother never wanted to create steadfast traditions out of fear they would become burdens. That can be a problem with some traditions. If we become too attached and inflexible, they cease to be a meaningful connections with one another and instead become obligations. Obligations breed resentments. Traditions should breed joy. I admit, I’m disappointed when the kids don’t want to partake in one of my traditions, be it one that I created with my family or one that was handed down to me. And sometimes, it’s easy to get so wrapped up in keeping a tradition that you become frazzled and stressed. All of which takes away from the purpose of having traditions–sharing connections, keeping a bridge to the past open, creating lasting joyful memories for your family. Having small children and a busy life has forced me to become more fluid, and that’s a good thing, because it not only allows happy traditions to thrive in our lives, it allows us (me, especially) to really choose what’s important. And that’s the thing I’ve learned about the traditions–the best ones conform to your life and don’t expect your life to conform to them. What are some of your favorite traditions, holiday or otherwise? One tradition in my family is that all other family members call and sing happy birthday to the birthday family member first thing in the morning, no matter where anyone is on the planet. The cheesier rendition of the song, the better! Thanks for stumbling on to my blog and good luck for the rest of the Challenge.